This is what I am listening to today while I am travelling. One of my favourite artists. The song Autumn Music 1 is by pianist and composer Max Richter from his 2006 album – Songs from Before. It is his third album after his second effort in 2004 – The Blue Notebooks – established him as a major player in his field. That album became a classic in this field of post-minimalist, neo-classical ambience (that is a mouthful eh!). The normal blog will resume on Tuesday, when I surface again in Granada, Spain. 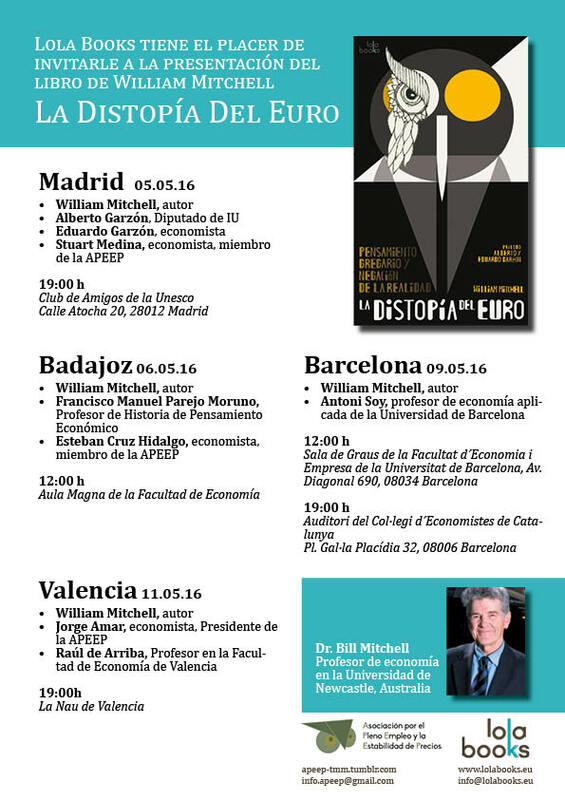 Here are the details of my upcoming Spanish speaking tour which will coincide with the release of the Spanish translation of my my current book – Eurozone Dystopia: Groupthink and Denial on a Grand Scale (published in English May 2015). You can purchase the Spanish version of the book – La Distopía del Euro – for 27.54 euros from Amazon. You can save the flyer below to keep the details handy if you are interested. All events are open to the public who are encouraged to attend. A Kindle version will be available soon (stay tuned for the announcement). Granada, great town! Be sure to have a lot of tapas. Music is one area where you don’t mind a ‘neoclassical ambience!’ Didn’t know about Richter, sounds like a slightly more sophisticated Ludovico Einaudi- nice in its own way but having grown up listening to Stockhausen/Boulez/Xenakis et al, I got a bit more used to grittiness and dissonance. There is a sort of ethereal sadness about this music – good for long haul flights. You need to use the latest catch phrase and start calling it ‘Disruptive economics’ – that might grab a few ears.